Amethyst Chips Magnetic wrap Bracelet/Necklace. A great piece of jewellery and so versatile, wear as a necklace , bracelet, anklet or even as a belly chain or as a head band. Let your imagination go, mix and match, wear how you like. These are a whopping 38 inches long giving you plenty of scope to experiment. 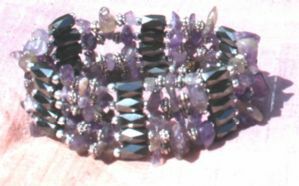 Made of Amethyst Gem chips and Magnetic Haematite. Note: not for use for people with pacemakers. These will come in a gift bag.